Lobby signs or reception area signs are displayed in many different types of businesses. We’ve made lobby signs for businesses that deal with dentistry, tires, and everything in between. A lobby sign is a great form of interior signage to have if you have a lot of visitors at your location. Aside from clients, a lobby sign can create a better atmosphere for your employees. Nothing is more impressive than a dimensional display of your logo positioned right where someone walks through the doorway. It makes a great first impression of the company and really personalizes your business. 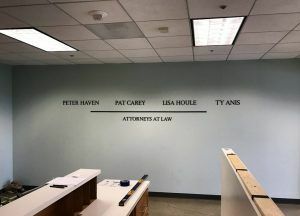 Pat Carey is a defense attorney who owns a law firm in Manhattan Beach, CA. Even before they moved into their new location, he was thinking of ways to make their office feel more like their home. He contacted us about a month before the move in date and already had a design in mind. To get started with a lobby sign, we always need to know what needs to be displayed and the dimensions of the space that it’s going on. It always makes things easier for us when the client knows exactly what they want so we can efficiently help them make their design into a physical sign. The reason we need the dimensions of the wall that the sign is going onto is that we want to make sure that the size of the sign we are quoting will look good in the space it’s going on. We made a few renderings for Pat until we landed on a size he was happy with. In the rendering, we scale the sign exactly how it’ll look on the wall so the client can make sure they are happy with how the sign will look before we start making it. The existing wall was gray so he wanted to go with simple, black, serif letters. Acrylic comes in black so we simply cut out the letters and the bar. Since each letter needs to be installed individually, a pattern is created before installation. Our installer puts the pattern up on the wall to install the letters to make sure that everything goes where it’s supposed to. The result is a minimal but very professional looking lobby sign that personalizes the room. Because Pat contacted us with plenty of time to go through the design and fabrication process, we were able to install the sign the day they moved into the new office. 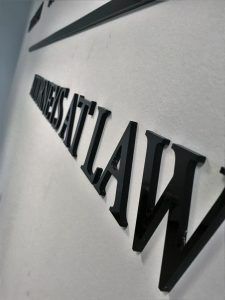 To see more examples of dimensional letter lobby signs, feel free to check out our website galleries. 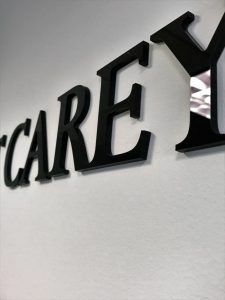 Like this lobby sign, we can make the sign from acrylic that is already a specific color, we can paint the acrylic a customized color, or we can laminate the faces with aluminum to give your sign a metallic look.